Naresh Engineering Works is one of the recognized leading manufacturer – exporter of swings and Garden furniture. It is known for producing innovative, creative, quality furniture for a broad range of Indoor and Outdoor use. 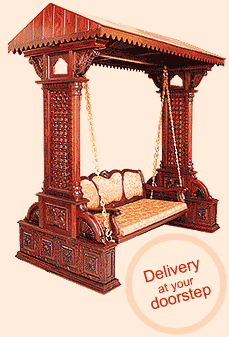 Now it is branded as INDIAN SWINGS traditionally designed with international quality standards. More than just a brand, Naresh Engineering works has always been working to improve the relationship between creativity and reality. To meet the latest demands of market, we have professionally dedicated team, inhouse research and development Center equipped with advanced technology. Top quality material, fine finish and ergonomic designs are our key focus areas as this enables us to provide our customers the best at most competitive prices. Copyright © Indian Swings, 2002 INDIA.